Today's March Meet the Maker prompt is achievements, and it got me thinking about what i would consider to be my biggest achievement so far. I've not made a secret of the fact that my art journey has been a tumultuous one. If you had told me at 18 that I would open a shop with illustrated products that i had made myself I would laugh in your face, albeit nervously, as a teenager I was discouraged from an artistic path to the point where I shied away from it, so for me my biggest achievement is this, my presence on the internet where I share my creativity. As a child I loved to create, my favourite TV show growing up was Art Attack with Neil Buchanan (I wasn't so fond of The Head though, he was creepy) I loved watching Neil make things, paint and draw and always had a plentiful supply of art materials to hand. Coloured pencils were my absolute favourite. When I moved up to senior school however that all changed. I went from having great fun creating things, to painting and drawing creating anxiety over what my teacher would say. From my very first piece of homework my teacher was negative, her comments full of derision, she would draw big lines through my work ruining the good bits as well as the not so good. At the time we had just moved back up to Lincolnshire after a couple of years in Northamptonshire, I was at a new school with very few friends and I was also put in a random group because they didn't have my SATs results yet, that first piece of homework was done at my Grandma's where we were staying while we were waiting for the people we had bought our house from to move out (they were being difficult!) and I worked really hard on it, so her big red lines were heartbreaking. It continued over the next 3 years, I remember feeling the dread in my third year that i had the same teacher yet again, and the only respite I remember having was when we briefly had substitutes cover her classes. When it came time to choose GCSE topics she said i would be wasting my time taking art, and that i would never make anything of my lack of skill. I soon gave up and listened to her, I must not be any good. I dropped doodling, I stopped watching art shows (I couldn't bear to watch Art Attack or Smart anymore) and I feigned disinterest. Secretly I still yearned to create, to play with colour and line and produce something that I at least thought was good, but her voice was always there, critiquing. I would visit my friends who were working on their GCSE projects and feel mournful that I just wasn't good enough, but i'd look at theirs and fail to see where mine fell down. I took the path of working towards a career in books or science, aced my English exams, went on to do A Levels and a degree and in that time I drew one picture. One. It was a sketch of a teddy bear which I had received for my 21st birthday. I never showed that picture to anyone, because there inside my head was that voice again, critiquing. By the time i finished my degree I needed a new creative outlet, so I started knitting and created this blog, I ventured into sewing and then decided I wanted to print my own fabrics to turn into knitting bags, if you look back far enough you can find them. To design fabric I needed to draw, so I bit the bullet and bought a tiny sketchbook and started to put pencil to paper. I designed some Alice in Wonderland patterns that I loved, but when it came to the idea of selling them I just couldn't do it. That little voice kept telling me they weren't good enough, my Dad encouraged me to open a shop (the original iteration of my current Etsy shop) but I chickened out, parents are always supposed to think your stuff is great right?! Fast forward to 2015, my life had gone through some major upheavals and I needed an outlet, something to do that allowed my creativity to grow. My natural instinct is and has always been to reach for the art materials when I felt troubled but I had always shrugged off what I was doing like I was ashamed. I had started drawing little pictures in my filofax, the changes to my life had been so great that at that point, the little voice in my head was critiquing everything I did so I was less bothered about it picking apart my art (Newsflash, that was my anxiety in my head there). I'd draw things I'd eaten or done or bought that day. My cousin had bought me a beautiful notebook which had handmade paper inside and I decided to keep my recipe planning for this blog in there, complete with drawing the process and the finished article. Determined to get over my mental block I shared a drawing I had done for my kitchenaid mixer in a planner facebook group, it was a new toy that I wanted to make a note of using in my filofax and Bake Off had just started back on the telly so I wanted to mark that too. It blew up! I got requests to turn that drawing into stickers, so I started doing some more drawings, banners, florals, envelopes and more, and sharing them. The overwhelming positive response from the planner community finally made that woman's voice die, people loved my little drawings and the shame fell away. I only wish I had shared something sooner. From there it has taken me a while (2 years to be exact) to get to a point where I was happy to create art, call it art, and sell it as art, Last year i tentatively posted my prints in my shop and made my first sale. My first sale of a piece of art from someone who doesn't know me, isn't obliged by being family to say something is worthy of putting on the wall. The feeling was euphoric! It is from there that my rebrand has stemmed. 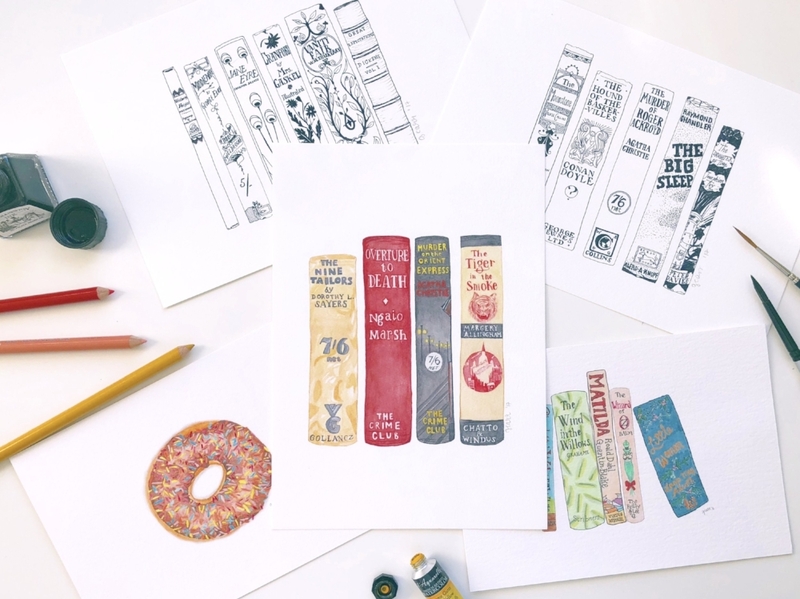 No longer am I just The Librarian, and my shop The Library Designs, I am embracing the direction my creative path is leading and rebranding my shop to be Georgina The Librarian, Illustration. Over the next few weeks you will slowly start to see my new branding appear over on etsy to fall in line with this website. I'm very excited about this new direction, it finally feels like I am embracing something I have hidden from for years. This is a big leap for me, but I have never been so sure of the step i needed to take. And to that teacher, *blows raspberry*!